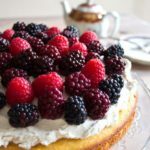 An incredibly moist almond flour cake with a velvety mascarpone frosting and topped with fresh berries. 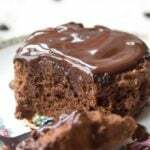 Gluten free, sugar free, low carb and so nutritious you could eat it for breakfast. When it comes to grain free baking, I have two firm favourites: almond flour and coconut flour. But if I had to choose…. almond flour would always win. 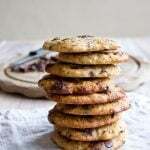 So – what’s so great about almond flour and how do I use it in baking? First of all, you can use it as a 1 : 1 replacement to wheat flour. Which can be very useful when you are converting old recipes to make them low carb and gluten free. Secondly, it tastes GREAT. 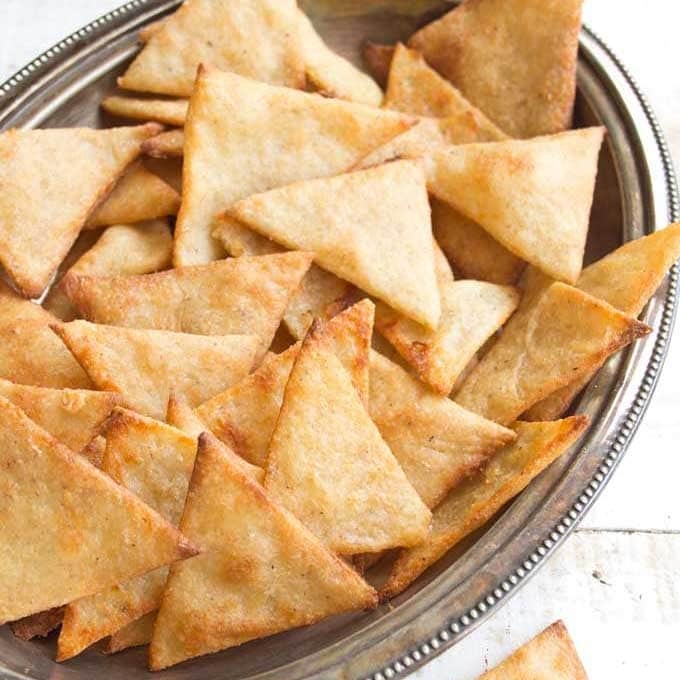 Traditionally, almond flour is often used in cookie recipes. But its mildly nutty flavour and fluffy texture is gorgeous in cakes and works well even for bread. 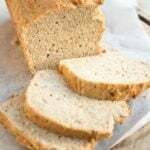 Check out my popular almond flour bread – it is getting rave reviews! With coconut flour, on the other hand, there will always be a slight coconut taste (which I don’t mind – but boy, some people can’t stand it). 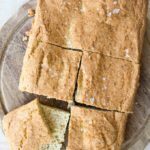 This almond flour cake recipe is super simple. It is extra moist because of the yoghurt – which also makes it taste kinda fresh. What are the different types of almond flour? I used ground almonds in this sponge cake. Basically, ground almonds here in the UK are equivalent to regular almond flour in the US. It’s made from blanched almonds without skins. Almond meal is a usually coarser and contains the skins – which are actually very nutritious and a great source of fibre. You could also use it in this recipe. I have tried the cake with super fine almond flour, which is powdery and almost white in colour. I have tried it in this recipe but cannot recommend it. It absorbs more liquid than regular almond flour / ground almonds and I found the cake ended up being too dense.
) Beat your eggs until they’re fluffy and have increased in size.
) Add your wet ingredients and blend until well-combined.
) Add the dry ingredients and mix.
) Fill the dough into a well-greased springform and bake at 180 Celsius / 356 Fahrenheit for 30 minutes or until lightly browned. 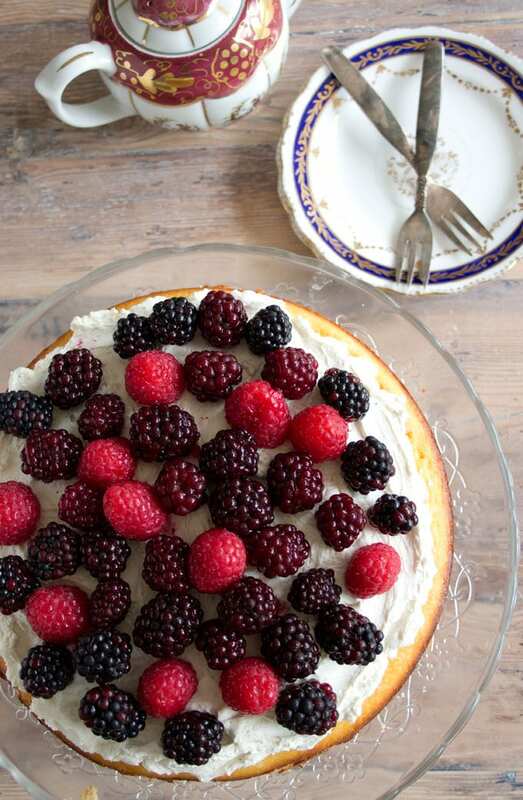 Once cooled, spoon over your mascarpone mix and decorate with berries. That’s it! Prefer dairy free? Use coconut oil instead of the butter, coconut yogurt instead of the yoghurt and whipped coconut cream in place of the mascarpone. Want to add a bit of zing? Grate the zest of a lemon into the batter. Need to speed things up? 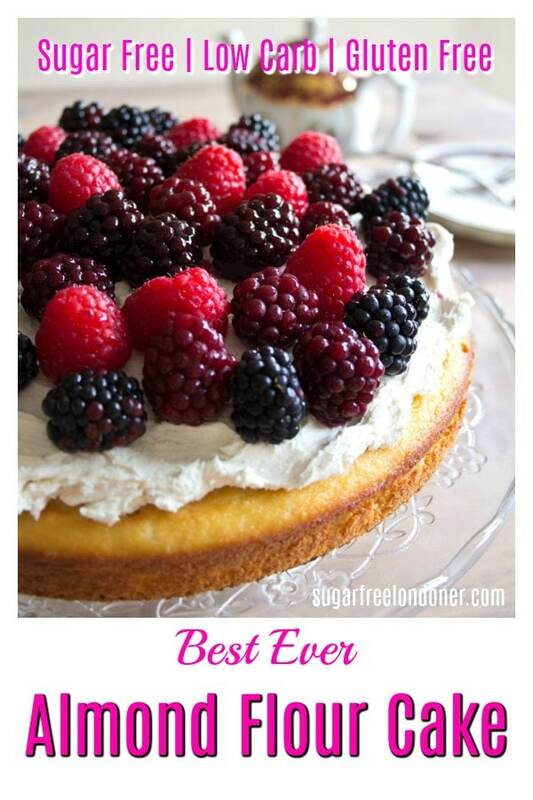 Add a handful of berries directly into the batter (stir them in last). Then you can leave out the mascarpone frosting. Like it Paleo? Replace the powdered sweetener with coconut sugar. 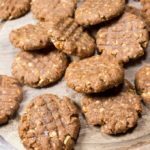 Insist on super fine almond flour? I recommend to reduce the amount to 3 cups for a moist result. And last but not least… Prefer coconut flour?? Halve the amount stated for almond flour. For a stronger crumb structure, you could also add 1 tsp of xanthan gum. 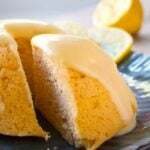 An incredibly moist almond flour cake with creamy mascarpone icing. 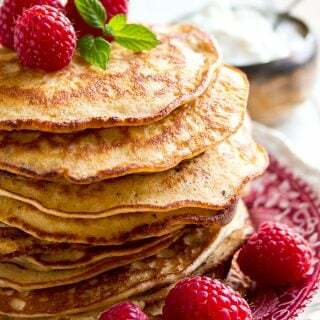 Gluten free, low carb, sugar free and so nutritious you could eat it for breakfast. Grease the sides of a 23 cm/9 inch diameter springform baking tin with butter and line the bottom with parchment paper. Blend your eggs until fluffy. Then add the yoghurt, 2 tsp vanilla and butter. Mix until well-combined. Then add the dry ingredients - baking powder, almond flour / ground almonds and sweetener. Blend until smooth and fill the batter into the springform pan. Bake for ca 30 minutes or until the top is browned and a knife inserted in the centre comes out clean. Blend the mascarpone cheese with 1 tbsp of sweetener and 1 tsp vanilla. 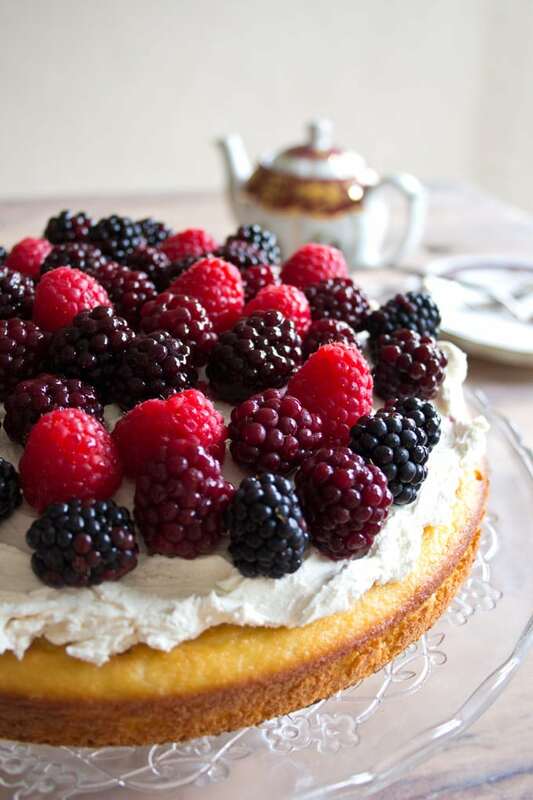 Once the cake has cooled, spread the mixture on top and garnish with berries. 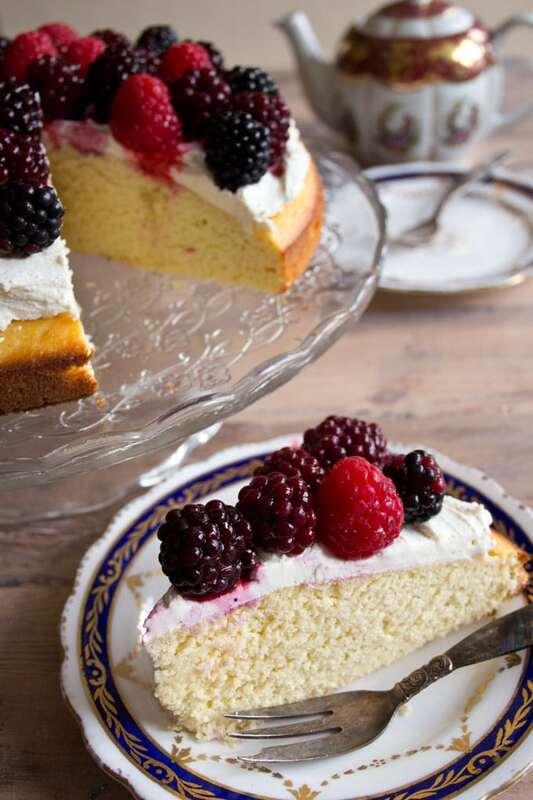 You can make this cake dairy free by using coconut oil instead of the butter, coconut yogurt instead of the yoghurt and whipped coconut cream in place of the mascarpone. To add a bit of zing, the zest of a lemon into the batter. As a variation, you could add a handful of berries directly into the batter (stir them in last). 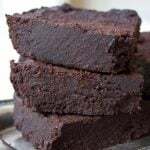 To make this cake Paleo, replace the powdered sweetener with coconut sugar. Without the mascarpone or berries, 1 slice of cake comes in at 267 calories, 22.5g fat, 3.0 g sugar and 1.5g net carbs. The post “Best Ever Almond Flour Cake” was first published in July 2016. 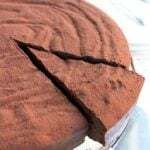 It was re-published in April 2019 with a recipe change and more details such as recipe variations to reflect how we make this cake today. Hey I tried it was beautifully moist, however I guess I have a sweeter tooth than you and just the cake without the mascarpone and berries tasted non sweet. Perhaps can increase the sweetener? What do you think ? So glad you like it!!!!! I made a half recipe of this a week ago and put it into a muffin tin which made 10. I added a grated lemon rind to the recipe and added some mushed raspberries into the mix instead of doing the cheese/berry topping. Very nice they are. Unexpected use of them was when I had a hot cereal craving the other morning – I crumbled up one of the cupcakes, poured a mix of boiling water and cream over it and mushed it up. I also added a bit of toasted coconut into it. And it became a lovely, creamy hot cereal breakfast. Am going to always keep some in the freezer now for this purpose…. and will try the same with the orange and almond cake. OMG I love the idea of a cake cereal! That’s pure brilliance. Also, grated lemon rind sounds like a great addition. That would be tasty in the mascarpone as well. Thanks for your input!! Can I make the cake overnight and then decorate it the next morning? Does it need to be kept in the fridge the whole time? You could definitely do that, and the cake would look fresher and better that way, too. If you just leave it out for one night because your fridge is packed, in my book that’s fine, as long as you keep it in a cake tin or cover it up somehow. I hope you’ll enjoy it! Just wondering if I could use finely ground almond flour in place of ground almonds ? If not, how did you grind yours ? I have a food processor would that work out ? This cake looks so moist, can’t wait to try it ! Have you ever tried makimg this as cupcakes? If yes, how long did you cook them for? Do you grind your own almonds ,or can you buy ground almonds?What is mascarpone cheese never heard of it, is it like cream cheese? In the UK you can buy ground almonds in the baking section of supermarkets. Mascarpone is an Italian cream cheese. It thick, creamy and has a relatively high fat content. It is used in Tiramisu, for example. Glad you all enjoyed it Millie! That looks so good. I’ll give it a go this weekend, using strawberries. Using mascarpone instead of icing is such a good idea. Love this recipe. A very simple and summery cake. Thank you for posting! You are welcome Birgit! Let me know once you’ve tried it! I just made this cake and it is so delicious! I used sugar free syrup instead of the xylitol and it worked really well. That’s so good to hear, thank you for letting me know. Which sugar free syrup did you use? Hello Alex, you can substitute with coconut oil! The eggs act as a binder. I am not sure cream is able to do that job 🙁 If you want to omit eggs you could try using flaxseed, for example. It is used in vegan recipes as an egg replacement. Google “flax egg” and take it from there. What size tin did you use, please? It looks amazing. I’m planning to bake it this afternoon! Thank you Jo! I used a 23 cm/9 inch diameter tin. Let me know how your cake turned out! Can I please ask what specific ingredients you used? Im using my fitness pal to log all the ingredients and nutritional information and its varying drastically form calories(+140ish) to fats(+12g) and proteins(+5) per slice. Hello Emme, I use a free website called caloriecount to calculate nutritional info. This is what their software came up with. I wish I had the answer for you, but I cannot guarantee the accuracy of the result. The only thing I can say is that (unless you have an actual nutritionist to hand and/or need to be 100% sure because of a medical condition) in the end it’s probably best to rely on your common sense and listen to your body. 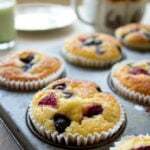 You know the ingredients are all good for you and the recipe contains only some sugar from the berries. 1) could I use dairy free yoghurt in this? 2) is almond flour the same as ground almonds? Hello! I am sure it would work with a dairy free yoghurt such as coconut yoghurt. Just check it has no added sugar! I actually used ground almonds myself, so sorry about the confusion. And it would of course taste nice with honey or maple syrup. You might have to reduce the amount of yoghurt a tiny bit because the sweetener is granulated and honey/maple is a liquid. Let me know how it goes! This so beautiful. I can’t believe it’s healthy! Thank you Karen! All the swish and no sugar rush…. Have a great day! Happy Birthday and what a pretty cake. It looks Delish! I am American and I self deprecate, too. I was never comfortable with compliments or praise. I do try harder to give a big smile and a genuine thanks. Have a great week. 🙂 In the spirit of the article, thank you so much!